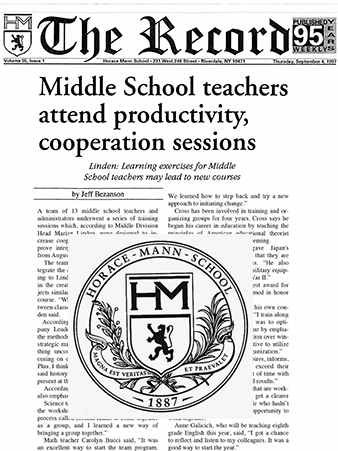 A team of 13 middle school teachers and administrators underwent a series of training sessions, which according to Middle Division Head Marian Linden, were designed to increase cooperation and productivity and improve interpersonal skills. The sessions ran from August 25 to 27. The team will use the skills to further integrate the middle school curriculum, according to Linden. Their efforts could culminate in the creation of new interdisciplinary subjects similar to the seventh grade Foundations course. “When students see relationships be-tween classes they will remember better,” Linden said. According to Matthew Cross, whose company Leadership Alliance ran the sessions, the methods he teaches are based on Japanese strategic management methods. “It was some-thing unconventional for teachers to do–focusing on organization rather than education. Plus, I think we learned a lot about ourselves,” said history teacher Duncan Wilson, who was present at the workshops. Copyright © 1996-2019 Leadership Alliance; All Rights Reserved. All text, images and content is the property of Leadership Alliance, not to be duplicated in any media without prior written permission.